Do you have any idea who Alan Rufus was? He was also known as Alan the Red, if that helps, but it probably doesn’t. If I were the one who had to guess, I’d say he was a stand-up comedian, or a low-level gangster, or someone claiming he’d been abducted from his bed in the middle of the night and probed with metallic instruments “that definitely weren’t from this world.” Actually, Rufus was a nephew of the eleventh-century English king, William the Conqueror, and because he happened to be in the right spot when his uncle took over the throne, he acquired more than a quarter-million acres of land and a vast fortune. In fact, when his assets are converted into today’s currency, they put him at the top of the list of Britain’s wealthiest people — from any era. In 1070, Alan Rufus became the Earl of Richmond, a title that granted him the authority to ruthlessly quell any rebellion against the king. He was a symbol of power and intimidation, and for the latter part of his life no doubt saw himself as the center of his universe. It might have been a struggle for Rufus to fathom that his name would someday become lost in history. But it has. I’d never heard of him until this morning. If you’d shown me his picture, I would have thought he was the model for the very first Jack of Clubs. Humans have always longed for immortality, and it’s inevitable that someone in control of a sprawling empire would presume to deserve such privilege. Monuments, pyramids, granite statues, and elaborate burial sites are a few of the ways departed rulers have tried to ensure that at least the memory of their achievements would live on. It rarely works, but there are exceptions. 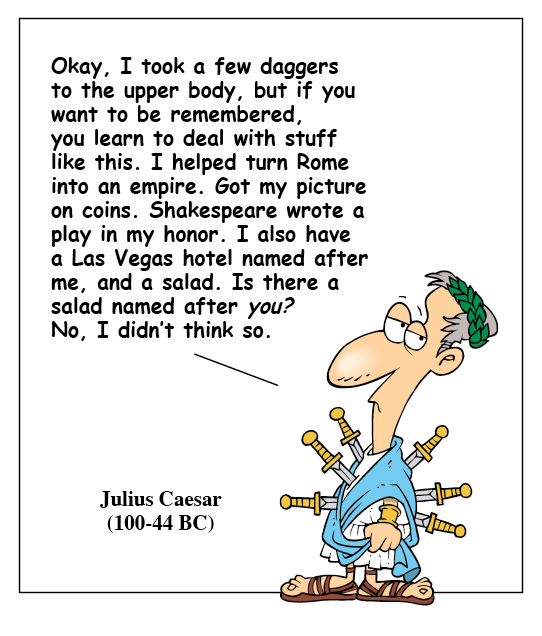 Julius Caesar remains as famous now as he was two thousand years ago. Is it because of his military conquests and political accomplishments? His relationship with Cleopatra? His violent death? Or did it take a play written by William Shakespeare more than sixteen hundred years later to secure the original kaiser’s place in our collective story? According to Marcus Aurelius Antoninus, the most philosophical of the Roman Emperors, “All is ephemeral — fame and the famous as well.” Marcus appears to have nailed it, despite the occasional Caesar, Napoleon, or Shakespeare himself. But how much longer will even those historical giants survive? The other day I asked a group of people, all under thirty, if they knew who Bob Hope was. Bob Hope was born in 1903, and lived to be a hundred. He was a star in radio, television, movies, and theater. A major star. For more than five decades, he was one of the most well-known celebrities on the planet. After I brought up his name, someone surmised that he was a talk-show host; another person offered that he might have been a politician. Bob Hope died only nine years ago, and although his signature song was Thanks for the Memory, his is already fading. In another generation or two, he’ll have gone the way of Josephine Baker and Gentleman Jim Corbett, and millions of others consigned to oblivion. If such universal recognition so quickly abandons someone like Bob Hope, where does that leave the rest of us? Many years ago, a friend and I visited Trinity Church in lower Manhattan. Now in its third incarnation, the church has stood at its present site since 1698. As we walked through the cemetery, we noticed that many of the headstones had been blackened by soot, or worn smooth by wind, rain, and time. With the names and dates effaced by the elements, it was impossible to know who was lying in those graves, many of them centuries old. It made me wonder about the idea that most of us — nearly all of us — live in relative obscurity and then evaporate into the past, forever. “Do you think anyone will remember us in a hundred years?” I asked her. “No one remembers us now,” she said. She was exaggerating, of course, but just slightly. The truth is, we are each part of a small cluster of friends, family, and acquaintances. We may see ourselves at the center, but it’s still a tiny circle of mutual awareness. If I were to travel to Buenos Aires or Shanghai or Nairobi or Copenhagen, I could spend the rest of my life canvassing residents and never find a single person who’s ever heard of me. To them I’d be another Alan Rufus, only without the real estate holdings and the ability to make my loyal subjects shake in their medieval boots. There are now more than seven billion human beings, and in the minds of a very large percentage of them, I don’t exist, except as a nameless speck in the same cloud of strangers they are to me. Taking the metaphor to its highest level, we on Earth are an even less visible speck in the immense cloud of matter that is the entire Universe. At some point in the distant future, our sun will expand to many times its current size, and the planet will be gone. Unless we’ve survived and moved on to a new home by then, we and everything we’ve ever created will disappear, too. Rather than being reduced to feelings of despair, I find this prospect exhilarating. It becomes an obvious waste of time to think of myself as some sort of success or failure, because no matter the scale of my imagined victories or defeats, it will someday — and soon — be as though I was never here. I can burn a million photographs of myself onto compact discs, publish a thousand books filled with my profoundly narrow thoughts, erect self-indulgent monuments that reach to the heavens. It won’t make a difference. I will be like the grim-faced ancestors who stare back at me from old family albums. There will be no connection or context, no reason for anybody to notice or care. Dante said this: “Worldly fame is nothing but a breath of wind, that now blows here, and now there, and changes name as it changes direction.” And that from a man who’s currently more popular than he was when he died almost seven hundred years ago. He can delay the inevitable, but Dante, too, will eventually be forgotten. “No one remembers us now,” she said. Not exactly true, but close enough. The pressure is off. We have each other and we have today; that’s all we can be sure of. The best we can do is pay attention to people, and be at least vaguely aware that some of them are walking around in pain. Rather than pursuing positions of power and intimidation, we can be sources of strength and support. We can resist the tempting notion that we are the center of anything, and express gratitude for our little place in the cluster. And while it may not be possible to truly know another person, we can try. That attempt to understand — merely the attempt — is what I perceive as love. We aren’t going to build an empire, but we can build each other. If enough of us do just that, the process may continue indefinitely into the future. And there’s our best chance for a taste of immortality. Really enjoyed the way you summarized this post .. Good one ! Thanks for reading the post, Nimue, and for taking the time to comment. This post was a wonderful way to start the day. Reading it, I became consciously aware of some of my most basic beliefs, and how those beliefs shape my life. Immortality? Who cares? In simplest terms, I live with the faith that everyone counts, every action has eternal significance, and no one will be forgotten. I know a few people who live as though no one counts, actions are without consequence and being remembered is nothing more than a marketing slogan for the Hallmark Company. I’m glad I’m me. Thanks for the marvelous reminder! I think sometimes our actions seem insignificant, but the consequences are real; we just fail to see them — or we don’t care. Your approach is refreshing, Linda. Thank you. There is someone who will never forget us. He knew us even before we were formed in the womb (Psalm 139). Even the very hairs on your head are numbered. ( Matthew 10:30). We can have immortality because Jesus says that if we believe in him, even though we die an earthly death, we will never die spiritually. (John 11:25). And of course John 3:16.. “For God so loved the world that he gave his one and only Son, that whoever believes in him shall not perish but have eternal life”. You are right about not worrying about being remembered by this world. No one here will remember us for long. But God will remember us forever. I was going to respond at length, Noreen, but I think I’ll write a new post instead. It’ll be more fun that way. Thank you for your continued involvement and support. Can’t wait to see you this summer. I really agree with you Noreen, everybody might forget us, but God will never forget us. Hey – the original “flash mob” … love it ! I find the word “forever” is over-used, as in, “This monument will stand forever” or “They’ll be remembered forever” or “I’ll love you forever”. WTF ! Do they know how long forever it ? It is like totally, super-long. And Noreen, I hope very much that there is a God who will love me FOREVER, but I don’t want his love if such silly “strings” are attached. Really interesting post. I’ve often pondered the folly of our attempts at earthly immortality as I walk around the Old Burying Ground in Halifax, which was closed to burials in 1844. John, I appreciate that you have time to listen to the radio and read blogs. How do you do it? As the old retail theory goes: Volume! Well written post albeit a bit too zen for me. I think of us like this: running through our blood is everyone of us inside each of us. And to quote a native american philosophy: we are all related. So it doesn’t really matter about whether anyone remembers us in this life or another – we’re still all connected. You’re right, Val: we must all be related. We’re just one big, strange family. Wow. You never cease to amaze me, Charles. I kept waiting for the punchline, the joke, a bigger bite of that self-deprecating humor of yours (Alan Rufus being the model for the Jack of Clubs was a taste) … and when it wasn’t there, I was at first surprised … and then glad. What a well-constructed, thought-provoking post to jumpstart my morning. I especially liked how you summed up your message in the last two paragraphs, and now I am left to ponder … who can I help to build today and in what ways can I express gratitude for the beautiful life I’ve been given? Time to get to work! I was waiting for the punchline, too, Karen, but it never came. And about building people and expressing gratitude — you’re already way ahead of me. Thank you, Saara. I value your opinion. The image of ants made me see an overhead view of crowds of people moving around at high speed. It does seem both aimless and purposeful, somehow. Thanks, Cat. And I’m glad to know you’re not depressed. Glad Noreen posted the Biblical perspective (saves me the time) and Sybil, there are no strings attached to God’s love, just as there are no strings attached to a parent loving a child. But we do desire our children to know us, love us and obey us, because we know what’s best for them, so even if we love all of our children the same, some are more pleasing to us than others. We are glad when our kids live correctly because it is for their sake, not ours. God doesn’t need anything but He created us (“Fathered” us humans) so He does want us to be safe and whole. Best analogy I can come up with for God. That being said, I must say that I NEVER worry about the “world” remembering me, honoring my life or anything of the sort. My task is to set the right example for my children and I know even if I make a million mistakes (as my parents did) that THEY will honor my memory enough to do at least a few things right (as I do). If we think and act outwardly, and don’t live as if we are the center of anyone’s universe, then we are very vital to the few souls around us and we will make a little bit of difference for the souls to come. Charlie, I agree that it is a relief to think we are not that important in the grand scheme of things. It takes away some of the stress of messing things up each day!! You’ll always be famous for your cookies, and your banana bread. Wonderful post, Charles. I feel the same way – it’s one of the reasons I enjoy going to the mountains. Those rocks were there thousands of years before I existed, they’ll be virtually unchanged in the eyeblink that is my lifetime, and they’ll be there thousands of years after I’m gone. It’s profoundly reassuring. I think I like that idea, Diane. I’d prefer becoming part of a tree to being scattered to the wind. I too was waiting for the punch line. Instead I found my eyes moisten and a lump in my throat. I’m afraid you struck more than one chord here with me today. I will have to regroup and re read. I’m glad you liked it, Michelle. Thank you for saying so. Well said, Charles. Thanks for the reminder. I think that may be one of our most important functions, Elyse: to keep reminding each other of the things that really matter. Thank you very much. I’m not sure yet what I’ll do with it, but I’ll let you know. Charles, I love this post so much, I can’t tell you. It’s funny and deep and true. I particularly appreciated that you find the prospect of earth’s ultimate annihilation to be exhilarating — what a great way to look at life!! I know that is not because you feel it gives you an “out” of not trying or feeling as if your actions won’t be “counted” as some readers seem to fear. It’s that all selfishness and striving for power is ultimately a waste of time…. I believe we are called to be grateful for our glimpse of celestial light in this beautiful world, and to be kind to others… and pretty much all else is vanity. I’m always grateful that I’ve met people like you, who already know (and have taught me) that selfishness and seeking power is a waste of precious time. Thank you for that, Betty. The worn gravestones in the cemetery at Trinity Church that you described validate my desire to be cremated and sprinkled in the ocean with the sea turtles. Thanks for this post, Charles, which is helping me work through a recent death. A good friend of mine lost her youngest sister (44) to cancer. Her sister didn’t want a service of any kind, and friends and family are respecting her wishes but also struggling with them. (In fact, per her wishes, she has been cremated and will be sprinkled in the ocean by her husband and only son.) Naturally, they’re also struggling with why she died at such a young age. I respect her wishes, too, but have also been wondering if a memorial service would have been a nice way to express gratitude for the small ways she impacted our lives while she was on earth. By “small” I don’t mean they were insignificant. I mean she didn’t have to “do” anything beyond touching the lives of friends and family. She wasn’t famous, she didn’t have a list of accomplishments. She just was, and, for anyone who loved her, that was enough and it was also more than anyone could ever need. She helped “build” us. She’ll be a face in an album with no name to a future generation. But right here, right now, she’ll be memorialized in our hearts and minds. I’m realizing that a service would be a fleeting moment in the scheme of things. In my lifetime, I won’t forget how special she was to me. Yup, I think that’s enough and I think that’s okay. Thanks, again. I’m sorry to hear about your friend’s sister, AA. But it sounds as though she did have a list of accomplishments, and the most important kind. I wonder if there’s some way to celebrate her life without violating her wishes about a memorial service. I really enjoyed the video as well, brought back some lovely and fun memories. 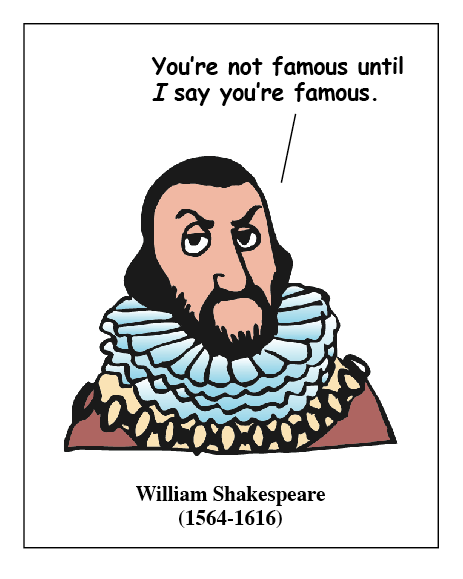 I think some people who have a bit of fame confuse being recognizable with an exaggerated sense of self-importance. But I’m with you, Mags — I wouldn’t know what to do with fame. Charles, we will continue to exist in the memories of those who knew and loved us. That might not be “forever,” but that’d be OK with me because those are the people who have really meant something to me. Thanks, Judy. I find myself relaxing every time I realize (again and again) that the future doesn’t belong to us. It sounds good, Mal, but we both know everlasting is the same as forever — and it just can’t happen. Sorry, Miss Meddle. I didn’t mean to scare anyone. In some African cultures, people are divided into three groups: (1) those still alive, (2) those who have recently died, and are therefore remembered by some of the living (the Sasha), and (3) those who died so long ago that there is no one still alive who remembers them (the Zamani). It’s an interesting way to think about life, and death. Your versatility as a writer has shined through once more in this post which is packed with delightful historical facts and thought-provoking insights. I like this side of you, Charles. It’s also refreshing to read the various responses of your commenters here. To love and truly understand one another. A bit of an ambitious undertaking I believe, but possible. Rather than fame, it’s the flame our love can kindle in another’s heart that really matters. And it seems you have already been a source of strength and support to many of your readers. Intelligent, deep, funny, and compassionate. What more can they ask for from a celebrity blogger that you are. You’re such an inspiration. Thank you, as always, for the thoughtful comments, Marj. You overestimate me, but that stems from your kind nature. Charles, you wouldn’t have gotten that much attention from WordPress or earned that many praises from your followers if I had simply overestimated you. Each page that emerges from this site clearly speaks of your love for writing and your readers. It thrills me that something I’ve written pleases you. Thanks again. If I’ve made your brain explode, well, I think we’re even. Who needs everlasting omnipresence in the minds of complete strangers? I won’t care after I’m dead anyway. Unless, of course, you believe that Caesar’s immortal soul is sitting on a cloud somewhere wallowing in the fact that people still remember his achievements. I for my part am happy to simply enjoy my life and *not* become famous for making other people’s lives miserable in the process. I hadn’t thought about that, Sandra, but the people whose fame lasts the longest are usually those who caused the greatest amount of suffering. Usually. I think this is a very good point. Since the Sumerians (and probably way before) we have struggled with looking our mortality in the eye but nowadays it’s even worse as we don’t seem to be able to see ourselves at all unless other people see us – or at least that’s what I figure lies at the bottom of our obsession with fame. So now this ‘dis-ease’ has spread to plaguing our experience of our living moments as well as hurtling us into an existential spin about the countless eons after our deaths. Now even while we are alive we are scared we are invisible until someone ‘sees’ us – recognises us – likes us – approves of us. Maybe it is rooted in our inability to live with dichotomies and so we can’t reconcile the fact that we are simultaneously important and insignificant, exquisitely individual and still part of a functional collective and so on? And I also agree that the really substantial parts of the web of the future are woven from the ordinary threads of cups-of-tea-and-cooked-dinners-clean-laundry -and-loaned-lawnmowers and we can make these love threads or break these love threads but it’s our only real chance at immortality. “…we are simultaneously important and insignificant.” That’s exactly what I was trying to say. You got there in six words. Thank you, Trisha. Eeeek! But aren’t you a dad? A husband? You’ll be remembered forever won’t you? Besides, you’ve been Fresh Pressed which means when the big dude with the internet eraser comes along, your blog stays! I’m sure I read that in fine print when one of the Happy Gang responded 4 weeks after I figured out the blog problem. I’ve had a few loving cats, but I had them neutered so there’s no hope of their offspring’s DNA catching a familiar whiff when I walk by. Sigh. But seriously, I like your take on love. I agree soooo much. When I think back past my grandmother (she was the only grandparent I knew), I realize that the rest of my family history consists of complete strangers. Because I don’t know their stories, I don’t know them. They’re just names in boxes on a genealogy chart, and most aren’t even that. Maybe the situation will change a little, now that we have so many more ways to record and preserve events and information. But what we choose to remember — that’s another issue. you win! for posting irene cara at the end of such a thought provoking post, you win, my friend. my guess is that with so many people in the world and talents unabounded that some of us will live forever (mostly here on the internet) and some of us will die without notice. but that’s always been the case. some of us will become popular and create a fad and a following long after we’re dead. that’s the way it works. it’s been proven, time and time again. even in our vastly miniscule lives we touch so many people in so many ways. it’s not up to us to remember us, it’s up to them. 🙂 i’ll always remember you, Charles. always. Thanks, Tanisha. I’ll remember you, too. But I think at some point, our experiences will become irrelevant to future generations, and they’ll have no reason to remember us. That’s why it’s so important that we pay attention to each other now. “Fame is like a caulk mural on a sidewalk. No matter how admired today, it will be washed away with tomorrow’s rain.” Anonymous. I’m guessing that should be “chalk mural.” Don’t you hate those automatic spell-correcters? Thanks for the quote, Miss D. It’s good to hear from you. Thank you. Just having one of those annoying senior moments! Thank you for the reminder to be present thinking and grateful for our today’s rather than future focused. A great way to start my week. One of the real values of blogging is that we can all remind each other of the things most of us keep forgetting. Thanks, Anna Marie. Hi Charles, I love this post! And as I mentioned in replying Noreen’s comment, it is true, that people might forget about us, but there is one thing for sure, God will never forget us. Thank you, Yulia, for always being so encouraging. I have a friend who lives near Bob Hope’s old estate. How sad..
There’s a video online of Bob Hope when he was 87 and George Burns at 94. It’s amazing. That’s a great story about the hitchhiker, Bruce. The difference between having no one in your life and even just one other person is immeasurable. Building the empire of ourselves: this is a totally bright idea for us to remember. Thank you, Marusia. It’s good to hear from you again. This was the first post I read of yours, and it still (many hours later) has me thinking. Three hours ago I would have said I appreciate that aspect of profundity, however, it is now 11:30 and I’m starting to lose sleep over it! All jokes aside, it is an intimidating concept to come to terms with (not because I want to be famous or be remembered in any particular way), but because you think of all the people that really MEAN something to you, and I just hope that THEY won’t forget. But alas, we’re going to be forgotten somewhere down the line, generations later. So I, too, applaud your bravery and optimism to say that you’re motivated by the thought of the eventual demise of Everything. I haven’t reached that point, but thanks to you, maybe someday I’ll be able to. Great post Sir Charles. I like how you ended this post, with a beautiful message. But I wonder does really fame survive for a certain period of time. I really do not know, who was Bob Hope. And I do believe neither any of my friends know him. And yes, we all are in our mid twenties. But after this post, I do have some idea about him. And may be someday, in between conversation I may pass on my knowledge about him to my friends. So does not it true that, there are some people who lasts for generations. But yes, someday they are going to lost in the pages of history. Arindam, I wonder about the people who have survived the passage of centuries: Shakespeare, Michelangelo, Alexander, Cleopatra. Whether they’re still remembered centuries from now will depend, I guess, on what people value in the future. Love your posts! Always a great laugh, but always a serious hidden lesson! This reminds me of my near-death-experiences. And I’ve had a few! Don’t worry – that’s a compliment! 😉 Call it what you want, but I am grateful for those experiences, and glad they happened early in my life. They made me realize that what matters is NOW, and what I’m feeling at that EXACT moment – how happy am I about my Life right NOW, not what others think! There were also flashbacks of the people I love the most – and how happy they make me. And truthfully, I was ready to go smiling, each time! But that’s not my life every day, so I use those critical moments as a reminder. Furthermore, although we cannot control if we will be remembered, I think the only thing we have CONTROL over is finding ways to make the world a better place. We can start by asking ourselves, after every word spoke & every action: “Does this have a positive impact?”. Thanks for the reminder & inspiration! Too many people live their lives according to what others expect of them. That’s sad. You’re obviously doing things differently, and, I’m sure, are making the world a better place. But please try to avoid those near-death experiences. Liked your post very much, Charles, particularly the line that went: ‘That attempt to understand — merely the attempt — is what I perceive as love.’ My philosophy has always been that while I’m here I need to be the best me that I can be. I believe that when the tail end of my life arrives there will be few regrets. I’m living in the here and now. As I won’t be here to witness it I don’t much care whether or not I’m remembered. I just wish it were as easy as it sounds, Mary — being the best we can be. There’s always room for improvement, and in my case, usually a lot of room. I’ve had a re-read, and Bob Hope will always live through Turner Classics. No one dies on Foxtell. Perhaps Alan Rufus should have thought of that. Maybe someone will do a sitcom about Rufus and it’ll go into syndication. You never know. That’s right, pop him in the Hisotry channel. When the topic of the all-time rich list came up, and Alan Rufus got a mention, I decided to dig into this unknown person’s history. I learnt so much that I just had to join Wikipedia just to expand the page on him. So what did he do other than fight and get rich? As it happens, a lot of memorable things, though he worked out of the limelight. Firstly, let’s free ourselves of a misconception: he didn’t oppress the English, he saved many of them! In the Land of Count Alan in Yorkshire, he created a Norman-exclusion zone, retaining the English lords and their heirs, side-by-side with his own Breton relatives, but keeping King William, Bishop Odo and company out. Check the Domesday Book (domesdaymap.co.uk) for details. Speaking of the Domesday Survey, Alan may have directed it: it started in his Counties, where it was successively refined, before proceeding to other parts of England. Far from despising the Saxons, when he acquired the lands of King Harold’s mistress Edeva the Fair (Edith Swannesha), he promoted her English tenants. He so loved King Harold’s and Edeva’s daughter Gunnhild that when the Archbishop of Canterbury forbade their marriage, he remained childless rather than marry another. This may be the source of the legend of the doomed love affair between Sir Lancelot and Queen Guinevere. For that matter, the Norman and later stories of King Arthur were all of Breton origin and written by acquaintances of Alan’s family. In one legend, King Arthur and his Knights lie sleeping under Alan’s Richmond Castle! Alan was responsible for the City and Port of London, which grew under the care of the civic leaders he appointed. There are hints that he was also in charge of the English Navy which drove away the King of Denmark and later stood ready to repel an invasion by Robert Curthose. Alan didn’t keep his money for himself: he donated hefty sums to poor relief, to the church, and to build beautiful towns such as Richmond, the “Jewel of the North”. I’ve traced what happened to much of his money: over the centuries it was invested by his brothers’ and sisters’ descendants in training and supporting skilled artisans who created great works of art and architecture (e.g. Fontainebeau Palace in France and other palaces across central Europe). Incidentally, Leonardo da Vinci’s “Lady with an Ermine” is a reference to Alan’s homeland, Brittany. The French Renaissance was promoted by King Francis I, who inherited most of his fortune from a line of Breton aristocrats who inherited from Alan. Alan’s wealth was also invested in education and innovation: the Gutenberg press was funded by lenders in Strasbourg where Alan’s family were the rulers; similarly for the Caxton press. Thus Alan’s money, well-invested, helped spread the Renaissance across Northern Europe. The Canterbury Tales were edited and published by a brother and sister who had inherited some of Alan’s wealth. 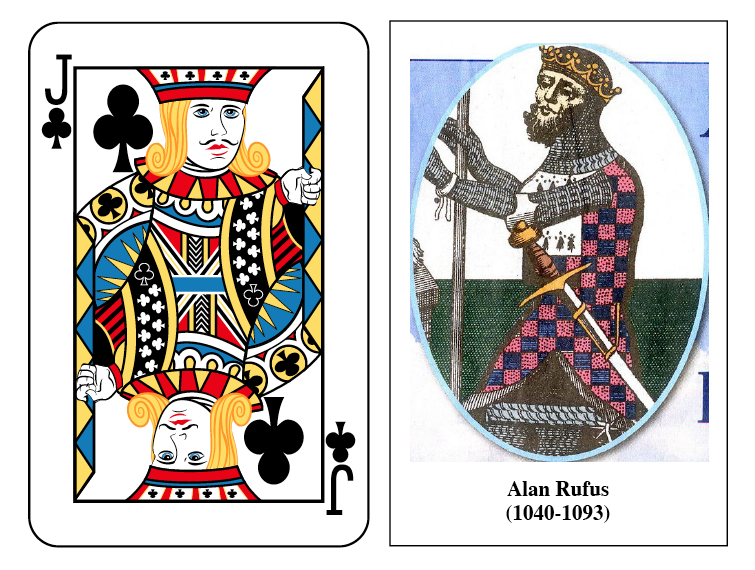 Across the centuries, numerous heirs of Alan’s fortune were described as “fabulously rich”. Joan of Arc’s campaign to liberate France was partly funded by Alan’s relatives who at the time ruled Lorraine: they were richer even than their famed Burgundian neighbours. Alan helped lay the foundations for Cambridge University, which subtly remembers him by the ermine cross in its coat of arms. His influence spread to America, because relatives of his were prominent among the founders of the Massachusetts colony – hint: Count Alan Road is in Winthrop. Cambridge academics founded Harvard University where, among other things, American Football was later invented. The design of Alan’s Richmond Castle was many years ahead of its time. He also built the first castle at Middleham, which was inherited eventually by Warwick “the Kingmaker” and was where Richard III grew up. Alan arranged with King Malcolm III (Malcolm of “Macbeth”) to settle Bretons in Ayrshire: this is where the Bruce and the Stewarts (Stuarts) – and subsequently the United Kingdom – came from. Orderic Vitalis, whose mother was English, was horrified at the Harrying of the North, and wrote that King WIlliam could not be forgiven for it. But of Alan Rufus, Orderic said: “He was ever studious for peace, a great lover of the poor, and an especial honorer of the religious; his death without issue occasioned no little sadness to the people”. Hopefully, that gives some idea of Alan Rufus’s actual character and contributions down to the present day. Thank you for the comprehensive report, Geoffrey. History is a tricky endeavor, as you know. The opportunity to present one’s side of the story is often a luxury that belongs to the victor after a military conflict. At the same time, objectivity may be suppressed in favor of wanting to keep one’s head. Thorough research — obviously a strength of yours — is becoming hard to find.